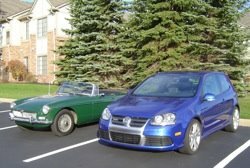 The Auto Snob: Bigger is Better? I recently read a snippet about the CEO of Fiat, Sergio Marchionne, proclaiming that the number of global carmakers will eventually shrink to six behemoths. This, from the over 20 companies of significant size that Automotive News lists on its "Guide to global automaker partnerships". I searched further and found this article. Marchionne says that in order to survive, a company with need a sales volume of over 5.5 million cars each year, a number to which his own Fiat does not even come close. But the fact is, there hasn't been a huge amount of consolidation in the industry since that first round of predictions almost a decade ago. These predictions were likely precipitated by the "merger" of Daimler and Chrysler in 1998, and the alliance of Renault and Nissan, which had been inked the following year. We all know how the former turned out, creating not economies of scale, but rather one of the largest destructions of company value in automotive history. The latter tie-up is still going strong, and paying dividends, but aside from that, there has been little action that suggests a highly consolidated industry. And why does Marchionne think that size is inherently good? While it's true that there are obvious advantages that stem from the basic principle of economies of scale, there are also downsides to this, most notably the loss of corporate agility. Corporations like GM have huge resources to offer its producers in each market, but if the act of marshaling those resources becomes cumbersome, decisions cannot be made in a timely manner, and competitiveness suffers. While GM is a great example of how size does not necessarily equal strength (as is Ford, one of the other four companies cited as above Marchionne's magic 5.5m number), there are some equally good examples of smaller companies that have so far proven resilient in this tough economic climate. Honda is thriving, as Japan's number-two producer, because the company has refused to compromise its ideals. Its growth has been organic, driven by demand rather than production. An even better example of the principle is Porsche, a company which sold less than 100,000 units last year. Despite its volumes, Porsche has managed its business so well that it is now financially powerful enough to have gobbled up a controlling interest in the only German company that is "large enough", Volkswagen. Porsche has achieved this clout with strict discipline, and tough decisions made based on the existing business and market climate (including the oft-derided decision to market an SUV). Size may be what's important to Fiat at this moment, but that doesn't necessarily mean that it is the major determinant to survival throughout the industry. It's true that for any company to survive, it needs to achieve a decent level of scale. But at a certain point, scale can become counterproductive if not managed the right way, and the right product decisions will, in my opinion, always trump size in importance.